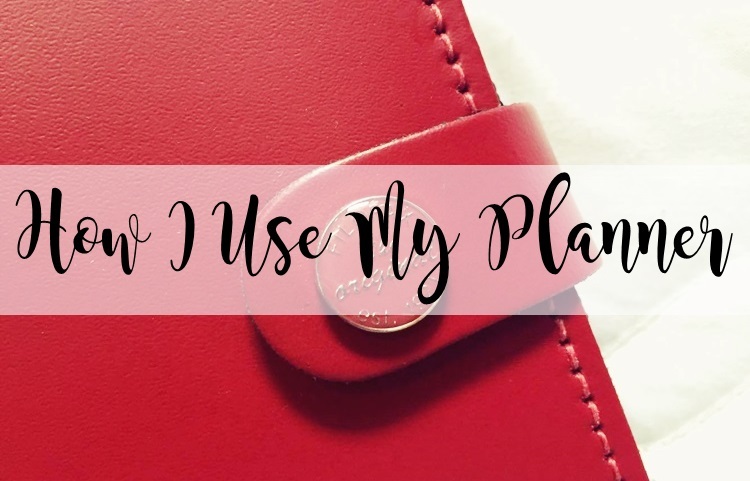 First of all, please don't be surprised on how I use my planner. 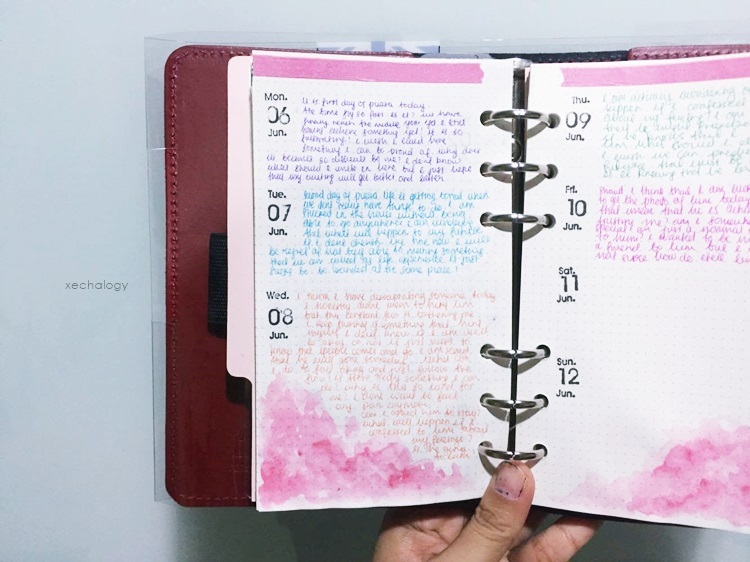 I don't know if it's only me or is there anyone else who turn their planner to a daily diary. 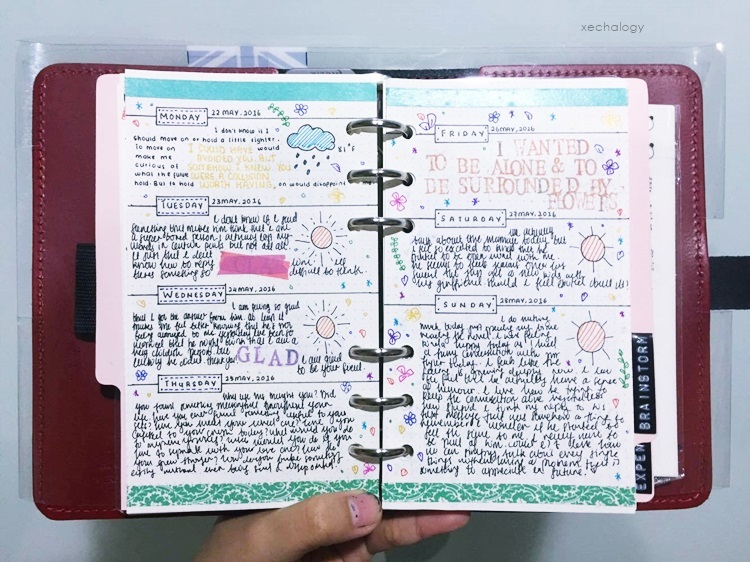 Yes, I am using my planner as a personal diary!!! 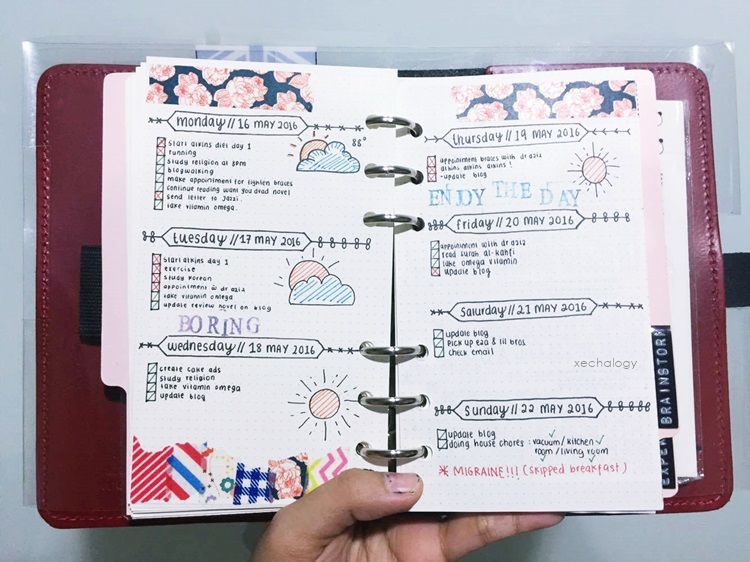 Planner keeps you organised of course. But since I don't really have much to do, I don't know what to do with my planner lol. I tried but I don't like to see how empty it turns to be when I made the to-do list for weekly spread out. I'll show you. This is the spread out for last week. I am wondering about.... Kenapa tulisan aku buruk sangat nih woi? Is it because I am writing in an uncomfortable position? I don't have study desk in my room so I end up meniarap dan menulis atas katil je. Hish. Maybe that is one of the factor of having an ugly handwriting ke memang buruk sejak azali? :o I hope we will move into another house soon. I went to our second house just now and kinda love my new room! The thing that I love about the room is there's a window and natural light boleh masuk. Senang nak snap gambar. Taklah gambar low quality mcm gambar sekarang. Huhuhu. I am using a date stamp that I bought from PippitZakka Store online. I just love using the stamp! And also the alphabet stamp to emphasize some words. Last but not least! Sorry because the photo is a bit off. This is current spread out for this week. I am using the colourful pen to write my diary. And I kinda love the watercolour effect on the bottom part of the layout. I will use the method to decorate the pages! I try to keep it simple and less childish. Well, regardless of how ugly it is to me, I still enjoy spending my time with pen and paper! Walaupun fungsi planner yang sebenarnya dah terlarikkk, I still manage to keep of what's happening throughout my life. Of course the personal things. Yang general things I will tempek kat blog je. You choose what you want to do with your stuff! And I choose to have a diary instead. I feel you.. 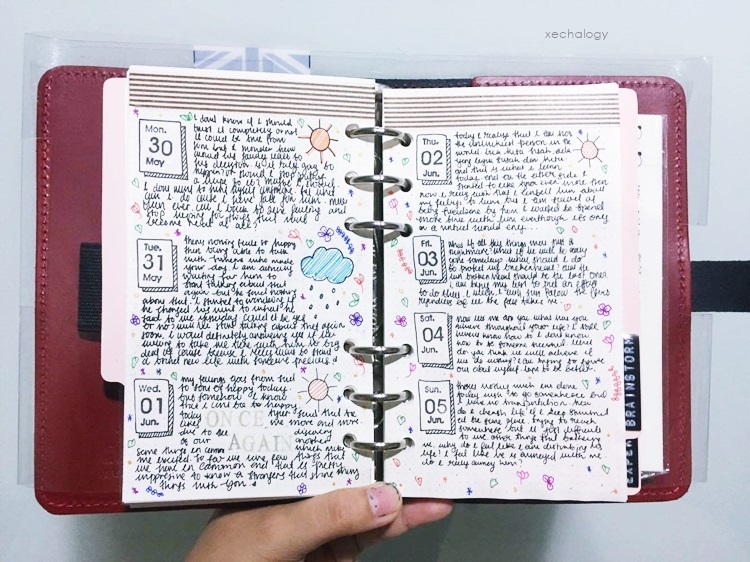 It's irritating me to see my journal's lack occupied layout. Haha. Thanks for blogwalking :) done follow you btw. omo qila pun use my so-called-planner last2 jadi diary je kan.
eh hoi tulisan qila lagi buruk ok so pls. hehehe qila rasa nk start new planner la next year. raya ni nak asingkan duit terus. planner tahun ni hodoh sgt aduhai rusak. kak cha planner apa paling affordable but bestttttttttttttt eheheh omo! u should make a post on that! review all planners pls <3 hugs!!!!!!!!!!! !